Hello Beauties! Yes, it’s Monday once again…no need to pout. I have a gem of a product to ensure a great hair day for you today and everyday this week. Meet Schwarzkopf’s BC Moisture Kick Beauty Balm. BC Moisture Kick Beauty Balm is created for normal to dry hair, straight, wavy or curly. It balances the moisture content of your hair and ensures an even and supple hair surface, just as a BB cream works as a base for your makeup. With it’s weightless formula it can be used daily. This gem works as a moisturizer, styling balm and offers heat protection. I have baby fine hair (just lots of it) so many products can easily weigh down my hair, this is not one of those products. Schwarzkopf’s BC Moisture Kick Beauty Balm left my hair soft and added some body. I used it on it’s own and with mousse, and was pleased with both results. On it’s own, I had soft body. The Beauty Balm is a great primer for any styling products so when used along with my mousse, I achieved great volume and control for my styles. For best results, BC Moisture Kick Beauty Balm is meant to be used on clean damp hair. Comb through your hair or spread through with your hands – which ever you prefer. * A little goes a long way – for medium length hair, use about the size of a quarter. Emulsify in your hands, put through your hair, then blow dry. If using with another styling product, always apply BC Moisture Kick Beauty Balm first. The smell is clean and fresh and doesn’t overpower the scents of any other products you may be using. It helps to detangle and aids in drying time. With it’s heat protection it helped my bleached blonde locks look a little less fuzzy after blow drying. I have to say, this gem has been a welcome addition to my hair care routine, it will be for you as well. It’s Monday…again. Many of us have a hard time to get up and go on Monday mornings. It seems that our get up and go just got up and went. I began the Monday Motivator series to help your Monday mornings a little brighter, to give you something to look forward to. Even though it may be Monday and your child decided to play hide and seek with your car keys and doesn’t know where they are “‘cuz they’re good hiders” and you spilled the entire bag of freshly ground coffee beans all over the kitchen floor…at least you will have a good hair day. This Monday’s Motivator is from Onesta. Meet Onesta’s Smooth + Shine, a thermal straightening creme. This gem of a product offers a silky, frizz free finish. It is light enough not to weigh down the finest of strands yet potent enough to smooth the most unruly tresses. It is humidity resistant (locks your cuticle shut – perfect for humid weather. Closed cuticle = no frizz). With it’s blend of certified organic ingredients such as Milk Thistle, Green Tea and Rhatany Root, Onesta Smooth + Shine adds luster and helps to protect hair color and vitality. 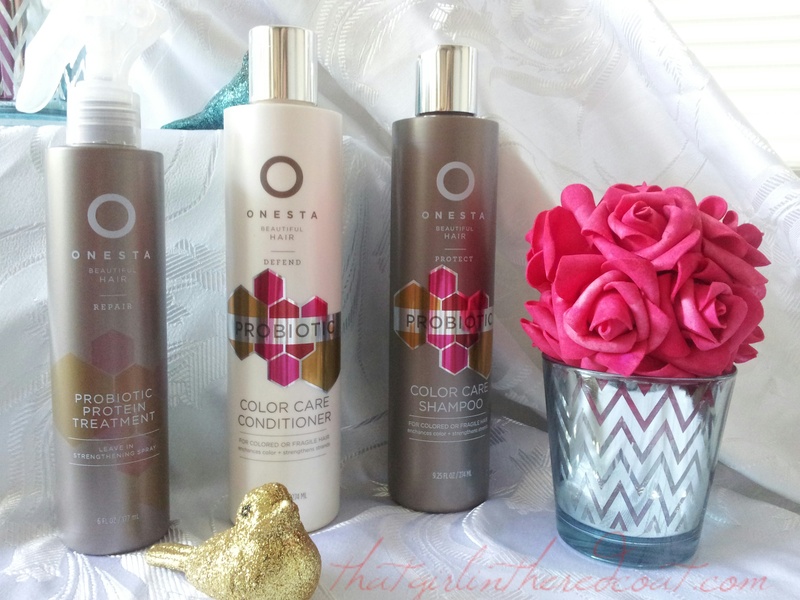 For those who are looking for a more natural professional hair care line, Onesta is for you! Their products meet EU Compliance and are paraben free, sulfate free, gluten free, cruelty free, vegan, free of dyes, DEA/TEA, Phthalates, Sodium Chloride and Propylene Glycol. Remember, this is a thermal styling creme, so it must be used with a blow dryer for the best smoothing results. To use; distribute through towel dried hair. Blow dry while guiding your hair straight with your brush. Follow with a flat iron if so desired. For thick hair – dispense a nickel size amount and emulsify in your hands, then apply to hair. 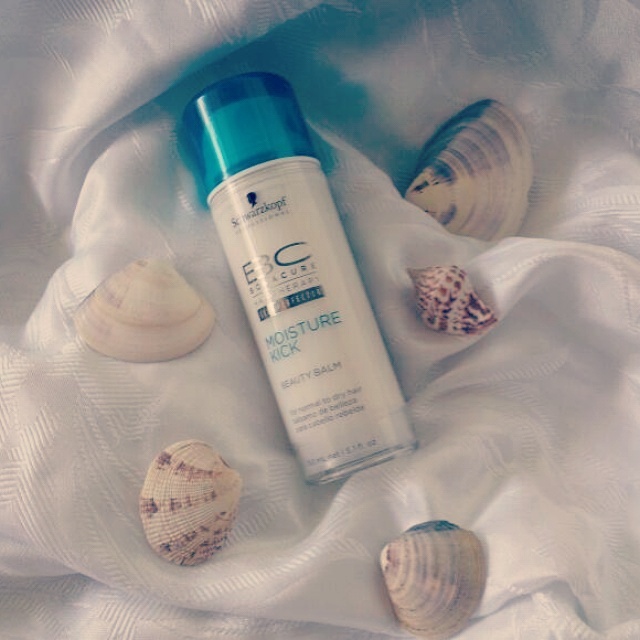 * A great feature of this creme – you can scrunch, diffuse or air dry Smooth + Shine for a more natural look on wavy hair. Smooth + Shine can be applied to dry hair to help tame frizz. It’s Monday. In my part of the world, it’s raining. It’s damp, it’s dreary, it’s Monday. As I was opening the shop this morning, I caught my reflection and noticed that although my feet were soaked, the hem of my pants now resembled a Jackson Pollock canvas and my coffee was cold, my hair looked fabulous. This got me thinking – there are many things we cannot control; the weather, our child deciding that underwear and nothing else is appropriate school attire 10 minutes before the bell rings, the driver in front of us that doesn’t understand his left blinker from his right blinker, a man asking if it’s possible to wax his own balls…you get the picture. What we can control is our hair. We can. Really. We can. Today is the beginning of yet another theme to help ease the pain and strain of Monday mornings. (well, every morning for that matter). Let me introduce you to That Girl in the Red Coat’s Monday Motivator! Each Monday yours truly will introduce you to a FAB! product to ensure a good hair day every Monday and everyday. 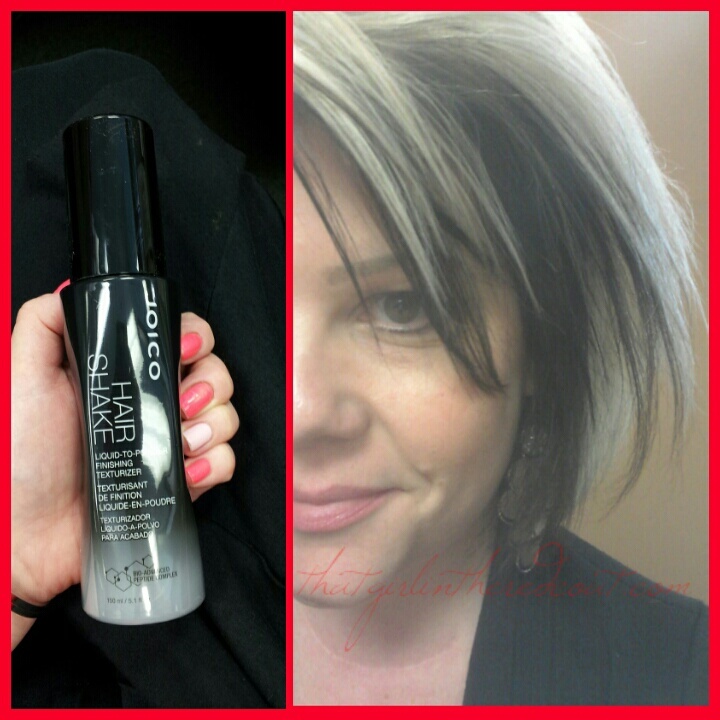 Let me introduce you to the newest member of the Joico Styling family – meet HairShake! Only two sprays of HairShake added this volume & texture!…if you love volume and texture…you are gonna LOVE this! – touchable and moldable layering styling grip = easy to create and recreate styles. Head on over to Joico’s Instagram @joico and their website http://www.joico.com for great styling tips and fun tutorials. A few weeks ago I heard one of my favorite phrases, “Sara, I have a new product. Give this a try and let me know what you think.”. The product was the new Probiotic Color Care line by Onesta. If you are dealing with dry, damaged tresses and prefer to use natural, environmentally friendly hair care products – this line is for you! 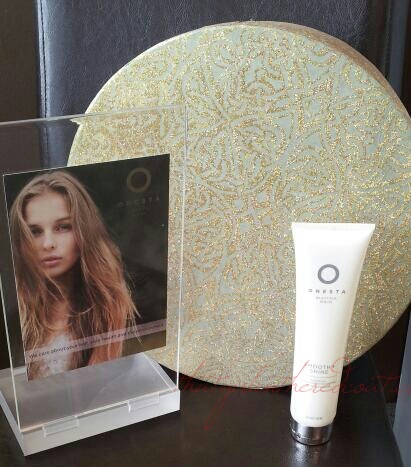 Onesta’s Proboitic Color Care Line has three products – Shampoo, Conditoner and a leave in Probiotic Treatment. Probiotic Color Care Shampoo – contains color enhancing extracts of certified organic Chai & Fennel. *Fennel is known to help hair’s color to look more vibrant and keeps the color looking fresh. The exclusive formula of Lactobacillus Probiotics helps to promote a healthy scalp and the combination of quinoa and vegetable proteins protects, defends and strengthens damaged hair. Probiotic Color Care Conditioner – Contains anti color fade extracts of certified organic Amla and Shea butter. The conditioner also contains the exclusive Lactobacillus Probiotic formula. Probiotic Protein Treatment – a liquid leave in spray treatment that detangles and strengthens hair. *when applied to hair before a color application the Probiotic Protein Treatment helps to protect the hair and evens out the hair’s porosity for optimal color results. First and foremost, I was pleasantly surprised by the Onesta’s Probiotic Color Care line. The shampoo is sulfate free yet had a nice lather – most sulfate free shampoo’s have little to no lather so many times we end up using too much. The conditioner slid through my hair with ease and left my hair feeling silky soft even though it was still wet. The leave in treatment…let me tell you – it smells wonderful, my tangles were worked out with ease and my hair felt soft and manageable. As you all know I am a bottled blonde – the Probiotic Color Care products did not leave my blonde brassy. I also have a blue streak and my color wasn’t diminished. My color, blonde and blue alike, actually seemed brighter and more vibrant. I used the Probiotic Color Care line for a few days before my latest color appointment and I have found my color to be a little brighter than usual…and we all know, when a woman is having a good hair day, everyone has a good day.